The Klüver-Bucy syndrome was first described by neuropsychologist Heinrich Klüver and neurosurgeon Paul Bucy. The story of this syndrome begins with a cactus. Mescaline is a chemical, derived from a cactus, that causes vivid hallucinations. It was studied (sometimes quite personally) by the psychologist Heinrich Klüver, who noticed that monkeys given mescaline often smacked their lips, which reminded him of patients with ​seizures arising from the temporal lobe. To try to find the brain region affected by mescaline, the pair worked with an aggressive monkey named Aurora. They removed a large part of Aurora's left temporal lobe, due to the lobe's association with seizures, to investigate it under a microscope. When Aurora woke, her previously aggressive demeanor had vanished, and she was instead placid and tame. Psychic Blindness - This is a term that signifies a lack of meaning in what was being viewed, and the monkey would view the same object over and over. In the words of the researchers, "the monkey seemed just as eager to examine the tongue of a hissing snake, the mouth of a cat, a wire cage, or a wagon as a piece of food." This behavior probably reflects a lack of fear due to removal of the amygdala and a lack of salience due to the temporal lobe's involvement in the salience network. Oral Tendencies - Like a very small child, the monkeys evaluated everything around them by putting it all into their mouths. 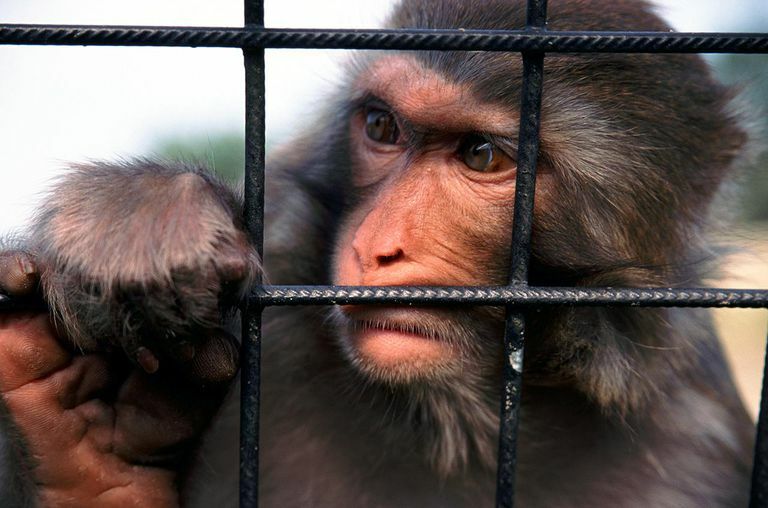 The monkeys would attempt to press their heads through cage bars in order to touch things with their mouths, and often, they never used their hands. Changes in Diet - These monkeys usually mostly ate fruit, but after the operation, the monkeys began to accept and consume large quantities of meat. Hypermetamorphosis - The monkeys had an almost irresistible impulse to attend to things in their view. In other words, the monkeys were what psychologists call "stimulus-bound:" anything that crosses their field of vision seems to require their full attention. Altered Sexual Behavior - These monkeys become very sexually interested, both alone and with others. Emotional Changes - The monkeys became very placid with reduced fear. Facial expressions were lost for several months but did return after time. In humans, autoimmune and herpes encephalitis have been reported to cause Klüver-Bucy syndrome in humans. Having all parts of the syndrome is, however, rare — probably because in reality, the syndrome was artificially induced and affected large parts of the brain that might not be normally damaged together. The first full case of Klüver-Bucy syndrome was reported by doctors Terzian and Ore in 1955. A 19-year-old man had sudden seizures, behavioral changes, and psychotic features. First the left, and then the right, temporal lobes were removed. After the surgery, he seemed much less attached to other people and was even quite cold to his family. At the same time, he was hypersexual, frequently soliciting people who passed by, whether men or women. He wanted to eat constantly. Ultimately, he was placed in a nursing home. Like many classical neurological syndromes, Klüver-Bucy syndrome may ultimately be more important for historical reasons, rather than for its immediate applications to patients. The first study was published in 1937. The reports of Klüver and Bucy got a lot of publicity at the time, partially due to demonstrating the temporal lobe's involvement with interpreting vision. Furthermore, the study added to the growing recognition that particular regions of the brain had unique functions, which were lost if that region of the brain was damaged. Klüver theorized in the 1950s that the temporal lobe had the role of dampening and regulating emotions in response to environmental fluctuations. This is similar to some theories today about networks in the brain controlling salience. Science is built on the work of others, and while Klüver-Bucy syndrome isn't very common, its effects on neuroscience are still felt everywhere in neurology today.